Performance Management Process – The Secret To Success. Don’t get left Behind. Do you need to re-think your performance management process? The workplace today has changed beyond recognition; new technology is continuously bringing efficiencies to our way of working. However, one thing remains constant – the performance management process. So, just how far has performance management moved forward in the past 70 years? To be fair there have been a few notable advancements since the 1950’s. The first variations came with the introduction of Management by Objective (MBO) later referred to as Management by Results (MBR). The 1980’s saw a move towards competency based evaluation. Then, as a way to inject objectivity, 360 degree feedback became popular in the 1990’s. However, the fundamentals have remained the same; the manager is ultimately responsible for giving the employee feedback. Does your performance management process align with today’s way of communicating? Now, consider the work force of today. It’s a new generation where continuous communication and collaboration is the norm. This surely begs the question; Is your performance management process out of date? Does it align with today’s way of thinking and communicating? Other HR processes; recruitment and learning for example have already made huge changes in the way they work. Is it time to add performance management to the list? Some companies have already rethought their performance management process. This seems to have been out of necessity rather than choice. A six month or annual review process just doesn’t suit a fast moving business environment where goals and priorities shift, sometimes rapidly. A different approach to performance management has been adopted. An approach where goals are aligned and transparent, feedback is in real-time and achievements are publicly recognised. In short, a bottom up approach to performance management which actually engages employees and where collaboration and openness are key components to its success. A bottom up approach to performance management creates a work culture where employees are primarily responsible for requesting their own feedback, not annually but daily in real-time. Feedback becomes interactive, timely and focused. It’s constantly streamed between manager and employee. The result …… the employee becomes more engaged and the manager gets meaningful, real-time information to improve performance immediately. Are your organisational goals constantly changing? Let’s now add objectives to the equation. With the accelerating speed of change in organisations and the demand for quick responses, annual goals or objectives can quickly become obsolete. With an open and collaborative performance management system – goals are worked on collaboratively across teams and the organisation as a whole. Individual performance is monitored continually and has direct relevance to results. Teams can rally around goals in an easy, open and social way. Teams stay focused on what really matters and individuals are encouraged to work towards driving the key targets that impact the business. Furthermore, employees are publicly recognised or instantly rewarded for their contribution and achievements. The result …… employees know how they’re doing; they feel more motivated, focused and accountable. Have you downloaded our free Manager’s Appraisal Check list? Download this essential Performance Appraisal Guide. 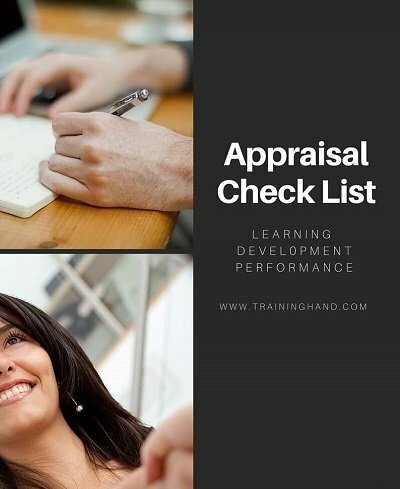 A handy list of the key actions to take when preparing for the appraisal, during the appraisal meeting and throughout the year. Is coaching part of your performance management process? And what about coaching – a key element of performance management? The traditional appraisal process makes the assumption that the manager is a good coach. With a bottom-up approach to performance management process, coaching becomes collaborative, not just top down. Employees are actively encouraged to ask for help throughout the organisation’s network. Colleagues, not just managers, give support. The result …… knowledge is shared across the organisation and coaching becomes an on-going, collaborative process. You may be thinking that this approach to performance management is too radical for your work culture. Indeed, it may not be the right answer just now but think carefully when re-designing your performance appraisal process. Consider the work culture you want to create; a collaborative, supportive work culture doesn’t fit snuggly with a traditional appraisal process. Collaboration, instant feedback and on-going coaching are quickly becoming the norm in the workplace. If you don’t re-think your performance management process soon, in two or three years, your organisation could well be lagging behind. Is your performance management system being used effectively? Is the success of a performance management process dependent on the quality of your system or is the secret to be found elsewhere? Your choice of performance management system will certainly have an impact on the success of your process but ultimately, in my opinion, the secret to success does lie elsewhere. Over the 20 years I’ve spent assisting organisations with performance management, I’ve seen an unbelievable change in the range of systems on the market and there’s no doubt that a lot of them will stand up to scrutiny in performance management terms. There is though a big but here. Having a top of the range system doesn’t automatically guarantee success. Good though it may be, even the ‘best’ system won’t work effectively if it doesn’t satisfy two key criteria; it must suit the culture of your organisation and it must be ‘welcomed’ by your workforce. Put simply, as long as your appraisers and also, very importantly, your workforce as a whole, actually want to use the performance management system, they fully understand its benefits and they know how to use it, the system should achieve its objectives (and potentially, even more). On the flipside, if people don’t want it, they won’t use it and they’ll tend to pay lip service to it. This is often the reason why performance management processes become tick box exercises rather than constructive processes linking performance review and personal development with organisational objectives. So, just how do you get to the point where your appraisers and appraisees actually want to use your system? In my experience, to really want to use it, they must like it. To like it, it’s essential that they find it user friendly and manageable in terms of time and effort. Critically, they must also understand why it’s worth their while making the effort to commit to it; in other words, they need be crystal clear of the benefits it will bring to them as individuals and the organisation as a whole. This is where the link to organisational culture comes in. People won’t warm to and embrace a performance management system if it doesn’t suit your culture. The system needs to align with the way your people think, communicate and operate. For example, one organisational culture may embrace a discussional format for assessment purposes whereas another may prefer a straightforward rating system. There are of course many other examples I could give and criteria I could mention. However, to choose the appropriate system isn’t enough to ensure success on its own. Once a system is in place, education comes to the fore. Some organisations make the mistake of assuming that appraisers and appraisees already know what they’re supposed to do and why they’re supposed to do it. Proactive organisation realise this isn’t necessarily the case. They make no assumptions; they take the initiative by organising training sessions for appraisers and briefing sessions for appraisees. The aim of these sessions is not so much aimed at teaching people how to use the system, but more to focus on why the system is worthwhile committing to and the benefits that will come from it. Ideally, these sessions ensure that everyone fully understands the concept of performance management, the part they will play in the process and the benefits they will derive. Objective setting should always be included because this forms a solid base around which performance can be reviewed, managed and developed. So the main thrust of my post is that the secret to the success of a performance management process lies with matching your system with your organisational culture and then educating your workforce on its use, its benefits to individuals and the organisation, and its overall objectives. Ultimately, your workforce must want to use it! Has Performance Management gone full circle?